You can access your Lead Gen settings by clicking on your main Setup tab > Settings sub tab > Lead Gen Settings sub tab. * Lead Gen settings only apply to a CAKE client who is licensing the Lead Gen side of the platform. The first section includes two settings applying to default Buyer Contract settings. Default Maximum Return Age: Sets the date range limit for returns to be processed by buyers. Default Timeout (ms): Sets the default amount of time in milliseconds before CAKE abandons an attempt to sell a lead to an individual buyer contract - forcing a post times out response. Normalize Lead Data: Automatically fixes common contact information input mistakes and lower/uppercase data where appropriate. Review Queue: Sends leads that did not pass vertical filters or campaign paid filters to the Review Queue from where they can be reviewed and accepted or rejected. Post All Leads to List Manager: If enabled, both sellable and non-sellable leads will be sent to list managers. Lead Statuses: A feature that allows for buyers to update statuses of leads post-sale. Enabling this setting shows the lead status configuration page and corresponding reports. 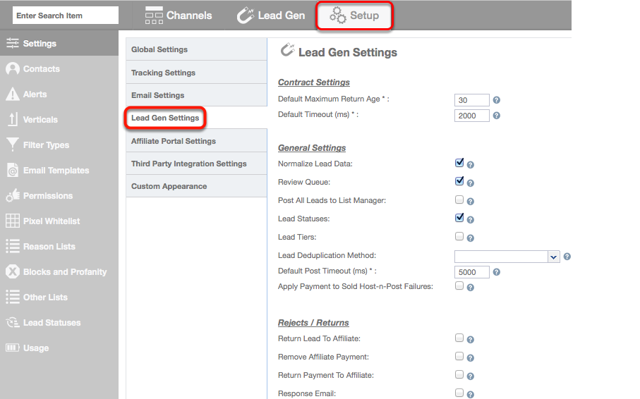 Lead Tiers: A feature that when enabled, establishes an affiliate payout tier structure to evaluate and assign incoming leads into separate buckets (tiers), allowing for different payouts based on the lead data. Lead Deduplication method: Email by default (which is what CAKE is using if you see a blank field), this sets the field that CAKE evaluates lead duplicates based on. Default Post Timeout (ms): The default amount of time in milliseconds before CAKE abandons an attempt to sell a lead to any buyer contracts - forcing a post times out response. This final section manages payout rules surrounding lead rejects (from the review queue) and returns. The first three are strongly recommended for all Lead Gen clients. Return Lead to Affiliate: If enabled, leads returned from buyers will also be marked as returned to affiliates, if/when the return is accepted by the CAKE client. Remove Affiliate Payment: If enabled, when a lead is returned from buyers, the payment will also be removed from the affiliate. Return Payment to Affiliate: If enabled, when a lead is rejected from the review queue, payment is removed from the affiliate. Response Email: If enabled, an email will be sent to the buyer when a return is accepted or rejected.